Images supplied by Sunseeker International. Sunseeker International is pleased to report a strong performance in 2017, with forecasted significant growth in revenue of 10% and 15% in volume vs the previous year and a substantial improvement in profit for the overall year vs 2016. The figures are the result of a significant restructuring and refocusing of the business, together with substantial investment across new product, improved facilities and its people. The market reaction to the company’s compelling new products and existing model refreshes has been particularly strong and has created a robust platform for future profitable growth. The results also cement Sunseeker’s position as Britain’s biggest boat builder and the world’s leading brand for luxury performance motor yachts. Phil Popham, CEO of Sunseeker, commented: “Sunseeker is global leading luxury brand which is a profitable, stable business with excellent growth potential. We have a strong forward order book, with 90% of capacity sold for 2017 and 50% already sold for 2018. Our robust NPD process has helped us achieve this success; delivering exciting new models, such as the hugely successful Manhattan 52 – our fastest selling model ever – as well as the Predator 57 MK II, Manhattan 66 and the new 76 Yacht, which is already proving to be extremely popular. Phil Popham with the editor of Luxury News Online, James W Phillips. Sunseeker will be unveiling two new models at the Southampton Boat Show – the 76 Yacht and the Predator 57 MKII, which have been developed with current and future trends in mind. 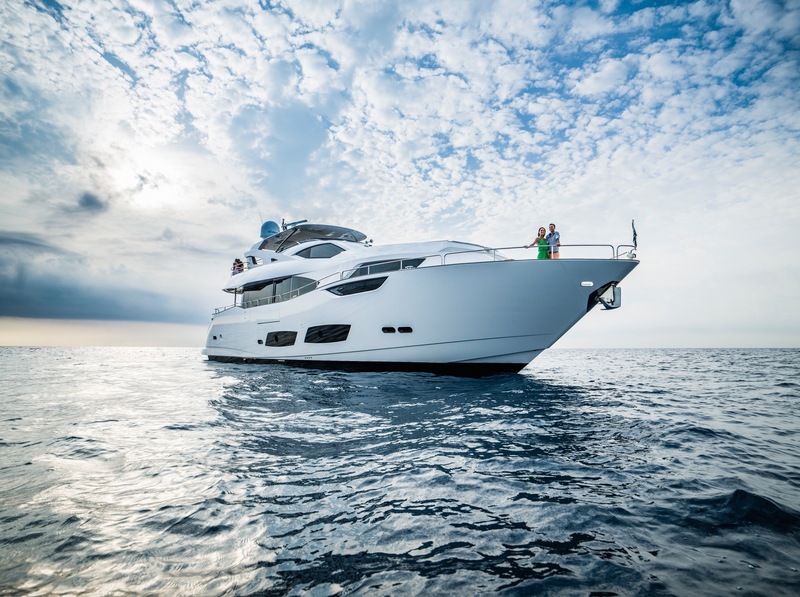 The exciting all-new 76 Yacht delivers an unprecedented level of luxury, sociability and entertaining space. Clever design maximises these traits, whilst an innovative use of glass enhances natural light, making this a bright and airy boat in which to relax and unwind. Furthermore, with 18 yachts already pre-sold, its desirability is evident. The Predator 57 MKII is an evolution of the popular Predator 57, which has been leader in its segment since its introduction in January 2015 and now offers even more elegance and style.